My favorite team, playing in a World Series game that I 100% watched, and I miss a bird clearly flying behind an outfielder on national TV? I missed it! I am slipping in my old age. I am slipping. After splitting the first two games of the 2013 World Series, the Red Sox and Cardinals left Boston to play game 3 in St. Louis. They played a tense game, eventually won 2-1 by the Cardinals after an unprecedented game-ending obstruction call on Red Sox 3B Will Middlebrooks. The Cardinals took at 2-1 series lead but eventually lost to my mighty Red Sox, 4-2. But something interesting happened back in the third inning of Game 3, something that until now had eluded my knowledge. With one out in the inning, Cardinals outfielder Matt Holliday popped a fly-ball to shallow centerfield off of pitcher Jake Peavy. Red Sox centerfielder Jacoby Ellsbury - soon to depart to the hated Yankees - charged in towards the ball but misplayed it - lost in the lights, most likely - and the ball dropped onto the field. The dutiful Holliday had run out the fly to first, and made a few steps towards second when he saw the ball drop. However, Red Sox second baseman Dustin Pedroia fielded the carom and alertly threw the ball to first, picking Holliday off and rendering moot the error. Thank you for indulging me in baseball talk. Anyway, something extremely interesting appeared behind Jacoby Ellsbery in the FOX reply of his blunder: a dang ol' bird. 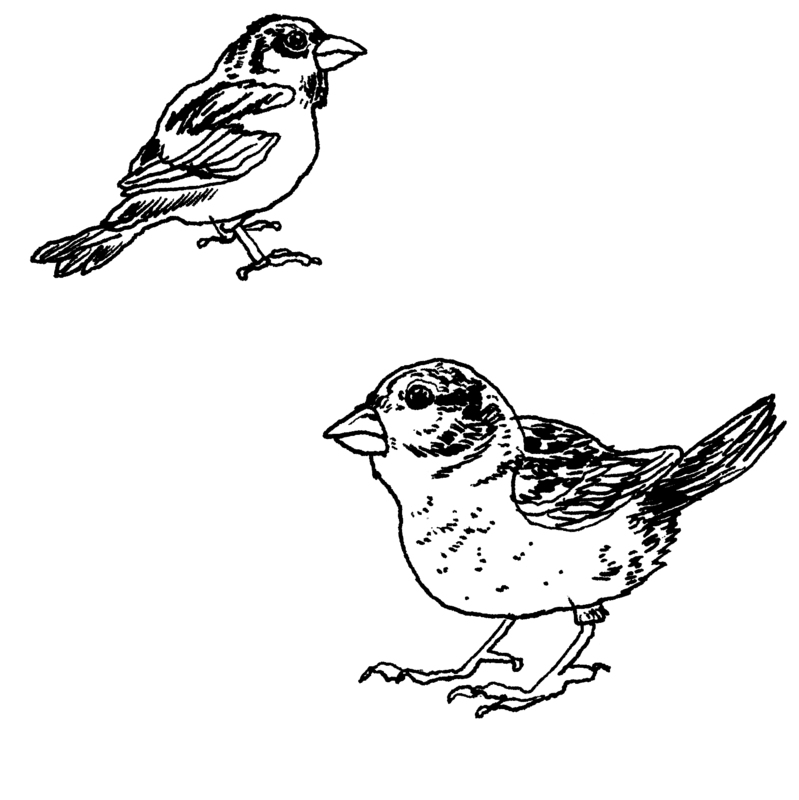 A bird - a passerine! - clearly flops to the ground right behind Jacoby. Weird, wild stuff. What species is it, though? Take a closer look at the GIF above, or go to the 1:30:21 mark on the YouTube video to see the bird flap awkwardly towards the ground and thump down, facing right. A noted Cardinals fan, the ABA's Nate Swick noticed the bird during the live broadcast and quickly posted to Facebook that the bird looked like a yellow-rumped warbler. Nate was of course limited to the single replay on the live broadcast and didn't have the luxury of an endless looping GIF and YouTube. I don't think it's a yellow-rump. I wanted to get some experts to weigh in, so I posed the question on Twitter. 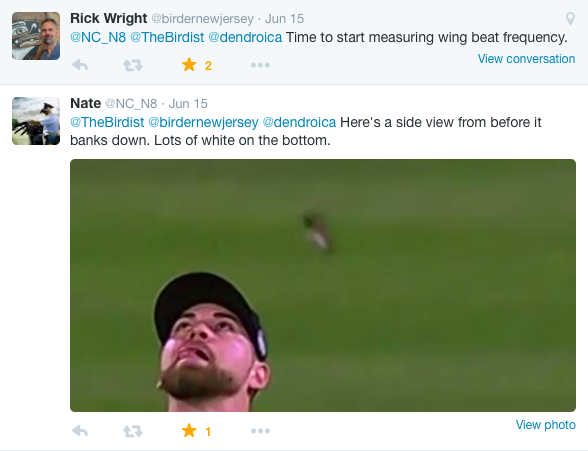 Responses were all over the bird. Mockingbird? Redstart? Something? It's tough to say. Let's think about what we know. First, it's October 27 in Missouri. That's late in the year, after the majority of migration is over. It's also fall, that time of year when migratory birds are drab and there are lots of youngsters around in whatever plumages they might have. As for the bird itself, it's brownish above and, thanks for some clear image-grabbing from Nate, pretty solidly white below. Just after this image, the bird banks back and its topside and tail are visible, as shown in the image at the top. The bird appears to have pale greater (and primary?) coverts - though I actually think it's just a trick of the eye. In some frames the bird appears to have a pale rump / upper tail coverts, in other frames there appears to be a dark center line to the tail with maybe pale sides, but in both cases the bird shows a very dark tail, even black in the early frames. So, uh, what the heck is it? My guess is (drumroll, please) Eastern Phoebe. It generally fits the patterning of the bird in the video: brown/gray above, white below, light throat (best visible in the video when the bird is sitting in the grass), and long, dark tail. It's common in the St. Louis area in October. Also, though I've never heard of this behavior, it's conceivable that, being a flycatcher, it could be attracted to the insects that congregate around bright stadium lights. Maybe? I'd love to be proven wrong. Go for it. And, go Red Sox!